The manta ray is an opportunistic feeder, and they will consume what they can find. They dine on plankton, small fish, and small shrimp. The types of fish they have access to depends on where they reside. These aquatic creatures are very migrational so they may move around to look for food and for warm water on a regular basis. If food supplies are short, they will swim very long distances to find what they are looking for. They aren’t territorial and they don’t follow the same migrational route every year. Instead, they seem to have an instinct that helps them to locate food that is in conditions that are right for them. While they can feed any time of the day or the night, the majority of the feeding takes place at night. This is because the plankton are easier to get at that time. Once the sun goes down, they start to rise to the top of the surface of the water. They are also known to feed at the bottom of the water too though. Since they blend in so well with the sediment, they can avoid predators and also have the upper hand when it comes to sneaking up on their prey. While they are feeding, the manta ray will swim in small circles. They have to move constantly so this helps them to be able to dine with ease. When they are consuming a school of fish, the circular movements allow them to get the fish all balled up tightly, then they can eat them easily without many of them getting away. While eating, the cephalic lobes are open, and they can use them to scoop plankton into the mouth if they like. Unlike other rays, they have the mouth in the center front area so that gives them an advantage when it comes to eating versus having that mouth elsewhere. The mouth is very wide, and that gives them the opportunity to take in lots of food and water at once. Water will pass through the gills while eating, and the plankton will get trapped there. Then it is going to move into the stomach region. Items that are too big will be filtered back out and that prevents them from taking in too large of food that they can’t digest. While the manta ray does have teeth, they don’t use it to bite their food into smaller pieces. When they are feeding at the bottom of the waters, the gills will rake along and filter our large debris. They have remoras on their body that see them as a host. Any food that is too large and falls out, the remoras will consume. On average, an adult can consume anywhere from 44 to 66 pounds of food per day. While large numbers of manta rays may be seen dining in the same location, they live an isolated existence and feed on their own. They have been observed using a variety of feeding strategies. This includes diving for the food, the element of surprise, and even rolling actions. 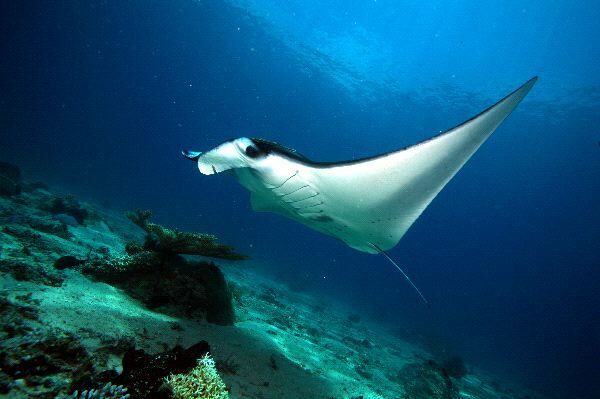 A manta ray can spend many hours every single day finding enough food. They are usually moving very slowly when they are feeding. They seem to be able to adapt to different environments in order to survive. Since the mothers don’t stay with their young after birth, they instinctively have to be able to find food if they are going to survive. The young stay very close to the shoreline for the first year of life so their only source of food at that time is plankton.